Research and discuss Norway. Divide the class into 4 or 5 groups. Have each group sketch an outline of a map on a large piece of chart paper. Locate Oslo, the capital, make a small Norwegian flag and attach it there. Research geography, i.e. fjords, and add this to the maps. Watch the hedgehog...does he want to be the pet. Look at the trolls underground, explain the evidence that they want a dog. Watch sequence of trolls coming up the ladder on the left side. List Treva's tricks, i.e. used mittens to warm ears...follow the blue-mittened troll. Using a plastic butter tub as a guide, cut out 6-10 circles of white construction paper. Write a sentence about the book on one side and illustrate that sentence on the other side. Punch a hole near the top of each circle. Trade with a friend who puts them in sequence and then puts a ring through the holes. Enlarge the troll pictures. Have the students pull out a cotton ball and glue this to the troll's hair. Make a background where the trolls are hiding. These can be used as illustrations for individual stories. 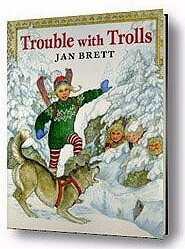 Go back and review what you have learned about Norway and trolls from this book. Write a Troll story while listening to Grieg's Peer Gynt Suite. Have parents help with open-faced sandwiches. Find examples of the art or rosemaling. Patterns are available at craft stores. Embroidery - look at the pattern in the book, repeat these using 1/4 or 1/2 inch squared paper. Use this for a border for a story. Use the same pattern with yarn and grid plastic, available at craft stores, and use cross stitches to make the design.